that's me! I was looking for a product that will make the skin looking good overnight. Impossible? well it's Possible in the form of Sleeping Mask! 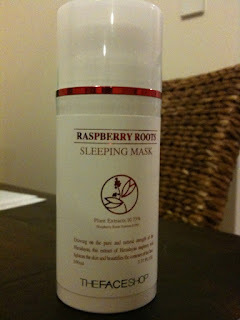 I picked up my first sleeping mask from The Faceshop and I love it! It's a clear gel base and smells fantastic. You apply it on your face after moisturising and wash it next day with warm water. It's just sinks in your skin, works overnight then next day you wake up with a great looking skin. I used this 3 times a week or if I have something on the next day I'll use it the night before. Also it's great on post blemish spot (after picking it..boohoo!). Wow, I've never heard of a product like this. Thanks for the review, I'm going to the Face Shop tomorrow to get it! @GlossQueen - it's a great product. and it's huge, it's 100ml $19.95 :) you may want to try the Faceshop in Joondalup. Because the city one doesn't have it. Thanks for the tip MsChikee. I've realised that the Face Shop in the city doesn't have quite few things, it's really annoying.